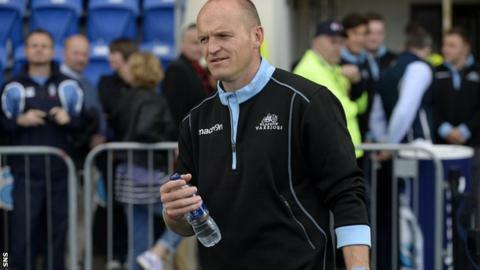 Head coach Gregor Townsend has hailed Glasgow's last-gasp win over Pro12 champions Leinster on Saturday night. But the Warriors boss is refusing to get carried away with the 22-20 triumph, and is craving more consistency from his troops. Stuart Hogg's stoppage-time penalty won the Pro12 encounter, after Glasgow had squandered a 19-3 half-time lead. "For our first game of the season it was very good, it was quick, but we were too flat at times," Townsend said. "If you let a team like that get a sniff of getting back in the lead they will take it, but I thought their character in the end to get that penalty in the 22, I was really proud of the effort. It was great to see the ball go between the sticks. "It was another battle, we've had really close games against them. Last year we played some of our best rugby in attack and defence, and only won by six points in the end, so they're always going to be tight games. "It's good to get the win against them but they're going to win lots of games and will be in the mix. "We now have to focus on two tough away games against teams that beat us last year in Cardiff and the Dragons. We have to play better over the 80 minutes." Glasgow lost last season's Pro-12 final to Leinster, and Tommy Seymour reckons Townsend's side have laid down an important marker by beating the champions. First-half tries from Peter Horne, Jonny Gray and captain Josh Strauss had given Glasgow a healthy lead, but Jack McGrath and Tom Denton crossed after the break for Leinster, adding to Jimmy Gopperth's penalty as the visitors hit the front. "It was a phenomenal effort from the lads, In the first half the boys played unbelievably well, it's got to be up there [with the best they have ever played]," Seymour said. "In the first half the continuity from the boys, the efficiency at the break down, the physicality the forwards brought to it and the back play was awesome. "We put ourselves in a great position going in at half time but the second half was sloppy, we probably tried to force things a little too much and tried to play too much rugby at times. That's the learning curve." The match at Scotstoun marked a milestone for Glasgow's Rob Harley, and he was delighted to see off Leinster on his 100th appearance for the club. "I was trying to put it out of mind but coming off the pitch and seeing the crowd, I'm feeling a bit emotional and can feel myself welling up," the 24-year-old said. "It was a great way to celebrate 100. "Some of the rugby we played in the first half was absolutely top class. We came out in the second half and Leinster showed why they are champions. "They threw everything at us and got back on top. It took huge resolve, none of the heads dropped and we kept our belief and managed to win it right at the death."